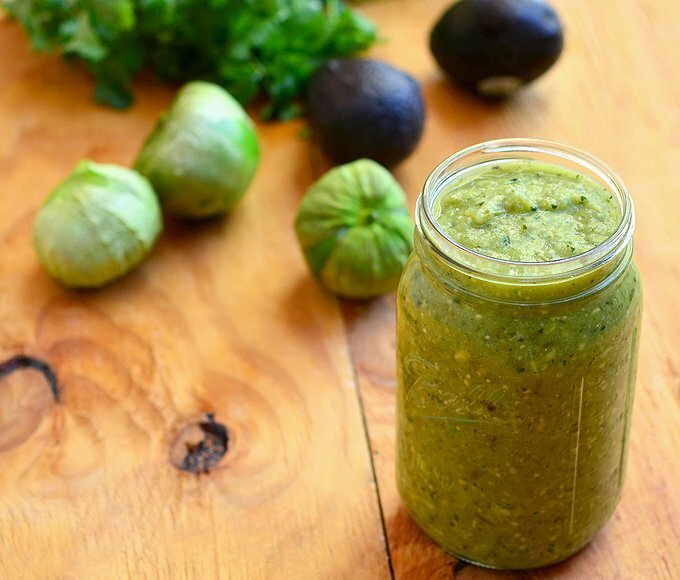 Avocado Tomatillo Salsa is about to become your top choice for condiment! Made with tomatillos, chili peppers, and avocado, it’s amazing over tacos, breakfast eggs or any of your favorite foods for a delicious kick of flavor! G and I had lunch at the Whittier branch of El Cholo Mexican restaurant (their Los Angeles branch opened in 1921!) over the weekend. As customary in most Mexican sit-down establishments, we were served complimentary chips and salsa as a precursor to our meal. The deep-fried corn chips were so warm and fresh and the salsa Roja nicely roasted and perfectly spiced, I was too full for anything else other than dessert by the time our waiter circled back to the table to take our order. But as much as I enjoyed the salsa roja, what really piqued my interest were the gargantuan jars filled with what looked like salsa verde displayed in their lobby. When I asked our server, he confirmed that the green sauce was, in fact, tomatillo salsa. Avocado tomatillo salsa, to be exact. And in the spirit of super duper customer service, he brought a small bowl for us to try. Mighty Lord have mercy! It was so darn good, I couldn’t pry the chip from the dip. By the time we left the restaurant, I was literally obsessed with the stuff and was resolute to make my own batch at home. Fortunately, I already have a tried and tested salsa verde recipe which I have been making for years and turning it into my newest addiction was just a matter of adding the right amount of avocados to achieve the texture and taste I was looking for. May I say my effort was successful? 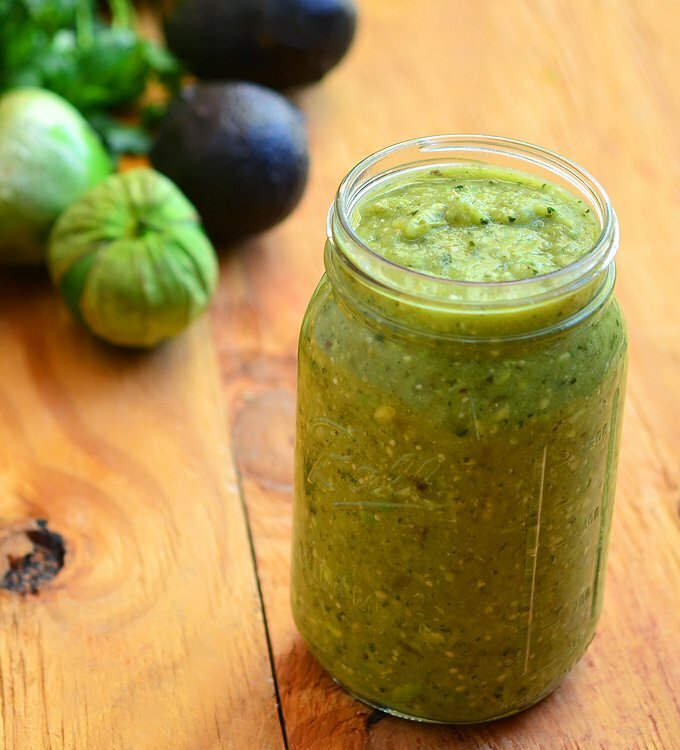 You guys, this avocado tomatillo salsa is the bomb! So good, you can eat it with a spoon! If you can resist long enough not to eat it with a spoon, it’s also awesome over breakfast eggs, grilled meats or seafood, and just about anything that needs an extra dose of yum. And let’s not forget it’s the ultimate dip, too! Give me a bunch of crisp corn chips in one hand and I can seriously drown in this salsa all day long. Want more ways to enjoy avocados? 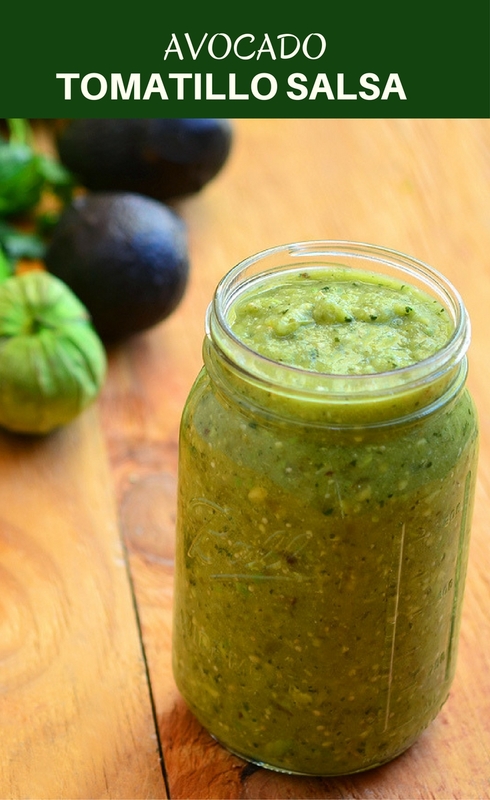 Avocado Tomatillo Salsa is about to become your top choice for condiment! Made with tomatillos, chili peppers, and avocado, it's amazing over tacos, breakfast eggs or any of your favorite foods for a delicious kick of flavor! In a saucepan, combine tomatillos, jalapenos and enough water to cover. Bring to a boil for about 7 to 10 minutes or until softened. With a slotted spoon, remove from water. In a blender, combine tomatillos, jalapenos, onions, garlic, cilantro, lime juice, and salt. Process for about 30 to 40 seconds or until coarsely blended. Cut avocados in half and discard pit. Using a spoon, scoop flesh. Add to tomatillo sauce and continue to pulse for another 30 to 40 seconds or until desired consistency is reached. Refrigerate for about 1 hour to allow flavors to meld. This is a great green sauce. I wanted mine to be creamy, so I added Sour Cream. Perfect! It makes a lot more than 2people can eat, so I freeze it. But be sure to freeze without sour cream. Just seems to be better if you add sour cream, after it has thawed. Thanks for the feedback, Sheri. Will definitely try your tip, sour cream sounds like a delicious addition! I am an avid canner. What are your thoughts about how this would work thru a water bath? I think it may need a bit more citric acid tho. Thanks. I’ll try it soon. I made a modified version of your recipe today. I had grown enough tomitellos and jalapeños/Serranos to make almost a double batch. Because I wanted to be certain my jars would have a shelf life I mixed cider vinegar and water for the cooking of the peppers and the tomitellos and included the onion. And because I needed a hot mixture to put in the jars before processing them in a water bath, my mixture was more the consistency of a chunky guacamole. I also put a slight 1/8 teaspoon of powdered citric acid in each 1/2 pint jar. What I tasted has a good bite and plenty of flavor. I think it is a winner 😁. Happy cooking. Thank you, Nancy, for sharing. I can’t wait to try your tips! We make this recipe without cooking the tomatillos and peppers. We also use only 1 avocado and add a bit more lime. We find the “raw” version is fresher tasting and more vibrant, and healthier too. Nice variation, give it a try! When you add the avocados, pulse only them a couple or so times, just enough to process them a little. Thanks, Fareeha. Hope you give this a try, it’s awesome with chips! sounds absolutely delish! love avocado! 🙂 pinned. just made this and it’s sooo good! I put the avocado pit in each jar to lessen browning. A trick I learned making guacamole. I am so excited to find this recipe! My mother ADORES the tomatillo salsa she gets from the store and she love avacados…this is perfect, especially since her birthday is next week! I now know that when she comes for her birthday dinner it will be mexican with this salsa…I think I will take Jason’s suggestion and roast the tomatillos and peppers! I have a feeling that I should make a double batch so she can have some to take home, as I do not foresee any being left from the dinner! I think I may try the BLACKENED TILAPIA FISH TACOS as well! Thank you so much for this blog! It is wonferful!!! Just making sure, do you not take the seeds out of the jalapeños? Sorry if this is a silly question, I have never made salsa before. Thanks! It depends on hot you want your salsa. If you want heat, leave them in. Does this turn brown with the avocado in it? It sounds delicious, but I would love for it to last longer than a day or two. It should last in the fridge for about 3 to 4 days. The lemon juice retards the browning a bit. you should try roasting the tomatillos, onion and jalapeno, 8-10 under the broiler. It gets a very nice roasted flavor. I roast my tomatoes and serranos when I make my salsa roja but I’ve never tried it with tomatillos. Good to know, thank you so much.